Rebecca, Lady Cardwell, is inconsolable after her beloved husband is killed during the Crimean War. She is bitterly resentful that it is his foster brother, David, who has survived and come home. Then David asks her to marry him and, despairing of any future happiness, she accepts. But the tangled web of past secrets and future complications brings her alive again–to both pain and ecstasy. Rebecca Cardwell faces the worst horror of the Crimean War when her husband is killed in battle, but his best friend survives. Riddled with guilt, David Tavistock returns home knowing that Rebecca must despise him for being alive when her young, handsome bridegroom lies dead. Worse yet is David’s knowledge that he has always loved Rebecca, and, in her sorrow he finds the opportunity to claim her as his own. As Julian Cardwell’s foster brother, David knows everything about the charming Julian, but he has never revealed the truth about Julian’s scandalous behavior. Rebecca believes she is entering a marriage of convenience, but even as she would deny her attraction to David, she begins to fall in love with him. 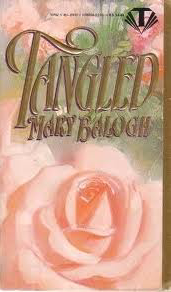 Tangled is a brilliantly crafted novel of love that cannot be denied, of war, sorrow, and joy reborn. This is a tangled tale of three lives bound together with bonds so strong that we, as readers, feel a part of their very souls. 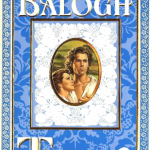 This moving, intense, dramatic, and sensual novel showcases Ms. Balogh’s remarkable talent.